How Do You Become a Traveling Nurse? Would you like to become a traveling nurse? Many hospitals will hire travel nurses for a specified period of time in an effort to keep skilled nurses on location while there is a shortage in permanent nurses or while nursing professionals are on leave. As a traveling nursing, you will enjoy the luxury of visiting a new city in the nation while you earn money and gain experience. If you are interested in filling in as a specialist in an area with seasonal population increases or you would like to work in a busy area that is prone to gaps in employment, you may be the perfect candidate for travel nursing. Read on, and learn how to become a nurse who can spend three months on assignment in some of the more diverse areas in the nation. The very first step to becoming a traveling nurse is to enroll in a nursing school that will prepare you to become a Registered Nurse. You have the option to attend a nursing program or a Bachelor of Science in Nursing, which can range between two and four years in length, but your degree can affect your ability to land a travel contract. Once you earn your nursing degree and you possess the experience and educational background that you need to sit for a NCLEX-RN exam, you can become a licensed nurse who can practice in the state. You must pass this standard national exam before you can work in nursing, even as an entry-level professional. The minimum requirement to work as a travel nursing is to hold a associate’s degree, but many settings prefer candidates with a BSN degree. How Much Experience Will You Need in Nursing? Once you meet the educational and licensing qualifications, you need to gain experience in a hospital setting. While some hospitals are willing to offer lower paying opportunities to professionals who have one year of experience, many employers who contract with travel nurse companies will prefer to hire nurses with two to three years of experience in this environment. You should scout out local opportunities in your area that are perfect for you to develop your skills and gain hands-on experience. Once you do this, it is in your interest to start comparing staffing companies in the travel nursing industry. There are several different travel nursing agencies that recruit experienced professionals and match them to travel assignments. You should begin by filling out an application for staffing companies after you have a year of experience and list your requirements and your interests. Be sure to ask about the terms of relocation, pay, benefits, taxation, and whether or not the agency offers you specific travel services to help you adapt to your new surroundings. 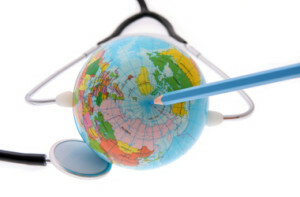 Choose a geographic location, compare the assignment details, and then work your first assignment to start getting a good reputation in travel nursing. A traveling nurse can earns $40 per hour depending on the region and the setting in which they work, according to Traveling Nurse. Be sure to compare many assignments with competitive salaries before you accept work. By doing this, you can earn a great deal of money while immersing yourself in a new culture. Now that you know how to become a traveling nurse, get to work.